There are always two sides to every story . . .
His whole life, Jonah Whitecomb has strove to meet everyone’s expectations of him: the perfect student, dutiful son, loyal twin, accomplished surfer, and powerful Magical. But behind his carefully composed façade hides the truth of how his family has fallen apart, leaving Jonah more often than not feeling adrift. To complicate matters, he fell in love long ago with a girl in his dreams, one he’s never told anyone about, including his twin brother. Just when life seems its bleakest, Jonah discovers that Chloe is real. Wanting to finally reach out and grab happiness for himself, he embarks on a journey to track down the girl of his dreams, only to find that happy endings aren’t always guaranteed, the best laid out plans can go horribly awry, and sometimes, you have to simply let yourself go along for the ride. 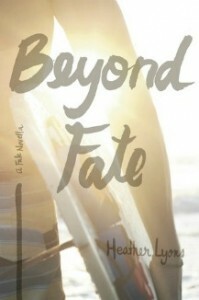 * Beyond Fate is Jonah’s point-of-view of the events of A Matter of Fate, and is a companion novella. I don’t even know where to begin with this review… I feel like I’m betraying Kellan!! But there were so many Jonah feels in this book!!!!!! Beyond Fate takes place a little bit before, then during, A Matter of Fate. It was so interesting to hear the story in his point of view. I especially loved seeing the whole Twin Connection mind thing between him and Kellan from his point of view! In A Matter of Fate, Chloe just sees them staring at each other. But from Jonah’s POV, we actually get to hear what they say to each other. We get a better sense of who Jonah is, why he did what he did, and how he felt about the whole situation in A Matter of Fate. It’s eye-opening and mind-blowing, seeing things from his perspective. We also get to know certain people better, such as Astrid, Callie and Jonah and Kellan’s father. Clearly, I dislike their father. I think I stated that in my reviews of A Matter of Fate and A Matter of Heart – he’s so mean to Kellan and Jonah! Callie is such a complex character, especially in Beyond Fate. We see more of her relationship with Jonah, and I can see where she is coming from better with her feelings and actions, but she got on my nerves a few times. In A Matter of Fate and A Matter of Heart, she’s a bit stronger, more outspoken. She was the opposite in Beyond Fate, but Jonah was breaking her heart, so I guess that makes sense! I still love Callie as a character and love her interaction with Chloe even more. I’m totally and completely Team Kellan, but I definitely felt for Jonah in this, and seeing things from his eyes, I was better able to understand where he was coming from, and my heart broke for him several times. I just wanted to slap the people who were making him hurt, and hug him like crazy! Overall, I really enjoyed reading this and seeing the events in A Matter of Fate from Jonah’s POV. I loved seeing the events that led up to A Matter of Fate, as well. I feel like I understand Jonah better, and I feel for him more. I’m still totally Team Kellan, and I can’t wait to read his novella, but I get Jonah more now than I did before. And as always, with all of Heather’s books, I highly, highly recommend this! But DEFINITELY read A Matter of Fate and A Matter of Heart first! It WILL spoil things, otherwise. Hmmm, I hadn’t heard about this books before, but I love novellas that help us understand characters and events on the main novels better! This series is amazing, and the novella was so, so good! Highly recommend!